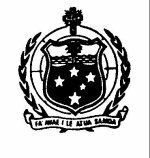 Independent State of Samoa Life Assurance Corp. Independent State of Samoa Trust Estates Corp. Independent State of Samoa Land Corp. Independent State of Samoa Homing Corp.
Department of Posts & Telecom.